Right-click (right mouse button click) on any frame, and then click 'Set Repeat Point' on the context menu. What does a repeat point stand for? 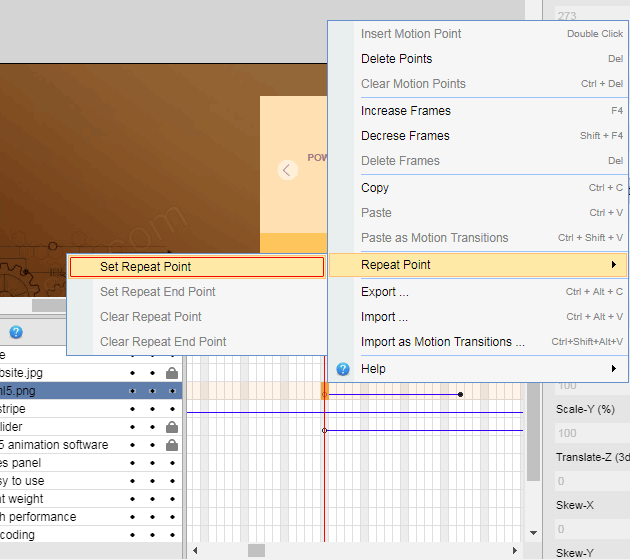 A pair of Repeat Point and Repeat End Point defines a range of layer animation to play repeatly. Repeat Point should be at a point before the ending of a layer animation, otherwise it will be ignored. Repeat End Point should be at or after the ending of a layer animation, otherwise it will be ignored. Repeat End Point is optional, if it is not set, the repeat range will be from Repeat Point to the ending of layer animation.